Many people dread filing their taxes simply because it could end up with the IRS contacting them for an audit. Some have this idea that the IRS will show up on their doorstep and take all their personal assets away. However, what actually happens in these audits is drastically different. Most of the time, only about one percent of people who file their taxes get audited. This is because the IRS uses the Discriminant Information Function system to figure out which returns are actually worth their time to audit. The DIF is a system that scores you based on your returns and how they align with people with similar jobs and income levels. If your data is drastically different from that of your peers, then the system will assign you a high DIF score. This could lead to an audit, but not necessarily. Today, we are going to cover the myths about who or who doesn’t get audited and why! Myth: You should be scared of an audit. Some people insist that audits are terrifying and they should be feared, but most people only need to answer a few IRS questions for them to leave you alone. Most often than not, the correspondence will ask if what they have on file is correct. If it isn’t, you can check for the difference and send them the correction. This is referred to as a correspondence audit, and it’s the more common of the two types of audits. In fact, this process seems so informal that some don’t realize it is an audit. The other type of audit is an in-person audit. An IRS agent requests an appointment with these people to review financial information. If this happens to you, feel free to contact one of the IRS tax attorneys at Tax Law Offices for legal representation. Myth: If you had someone professionally file your return, you will not be audited. Unfortunately, paying for someone to assist you as you file your taxes won’t prevent you from being audited. There are quite a few tax places who will promise you the biggest refund possible, but that can be a problem. In many low-income areas, these people will engage in purposeful fraud without letting their clients know what they are claiming on their taxes. For example, they’ll do family splitting in order to get the most out of the Earned Income Tax Credit—even though doing so will likely trigger an audit, severe penalties, and interest. It’s always good to double check your tax preparer’s calculations and make sure to use a company you can trust. While we have only listed two myths about audits today, we are going to write more about them in the future. 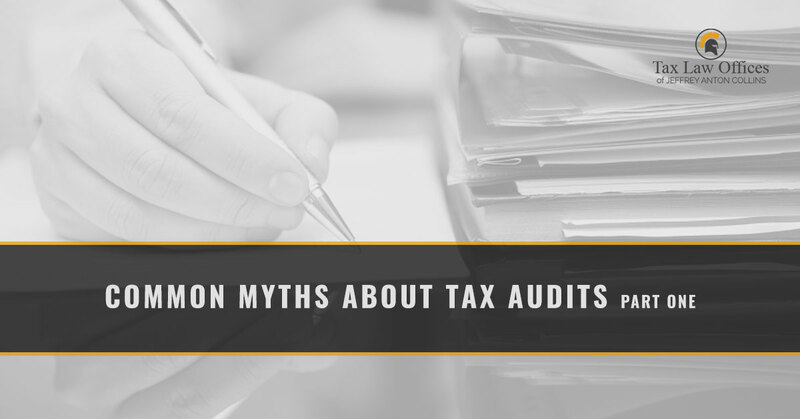 Check back soon to see what other myths we can debunk for you about IRS audits! If you are in need of an IRS tax attorney to represent you in the case of an audit, be sure to contact Tax Law Offices today! We look forward to speaking with you about your situation soon.